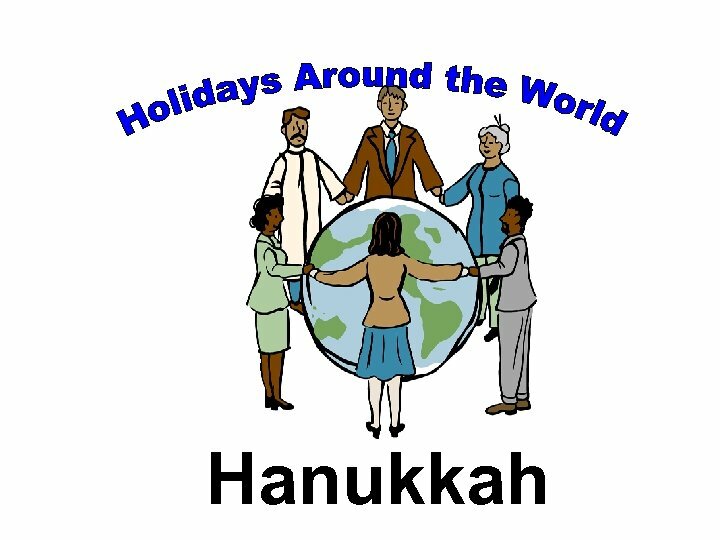 Hanukkah Chanukah is an eight day holiday which begins on the 25 th day of the month of Kislev. 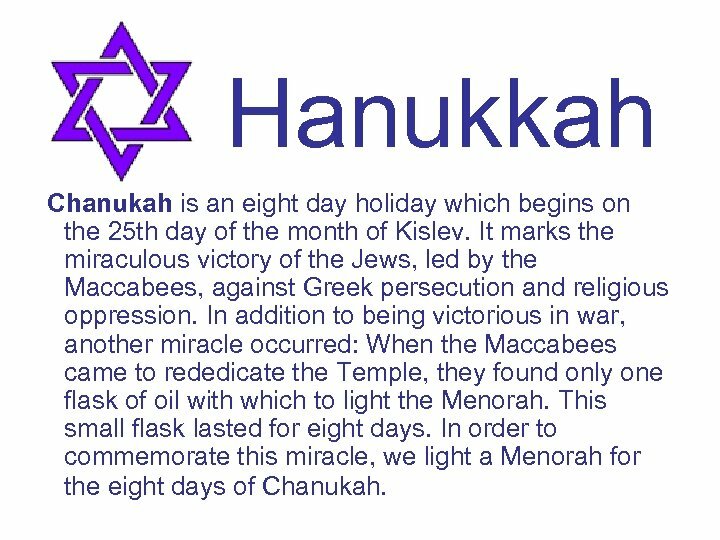 It marks the miraculous victory of the Jews, led by the Maccabees, against Greek persecution and religious oppression. In addition to being victorious in war, another miracle occurred: When the Maccabees came to rededicate the Temple, they found only one flask of oil with which to light the Menorah. This small flask lasted for eight days. In order to commemorate this miracle, we light a Menorah for the eight days of Chanukah. 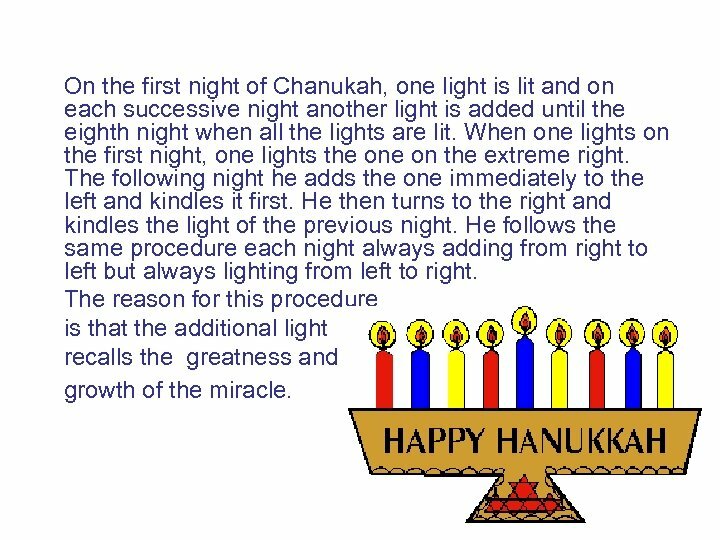 On the first night of Chanukah, one light is lit and on each successive night another light is added until the eighth night when all the lights are lit. When one lights on the first night, one lights the on the extreme right. The following night he adds the one immediately to the left and kindles it first. He then turns to the right and kindles the light of the previous night. He follows the same procedure each night always adding from right to left but always lighting from left to right. The reason for this procedure is that the additional light recalls the greatness and growth of the miracle. 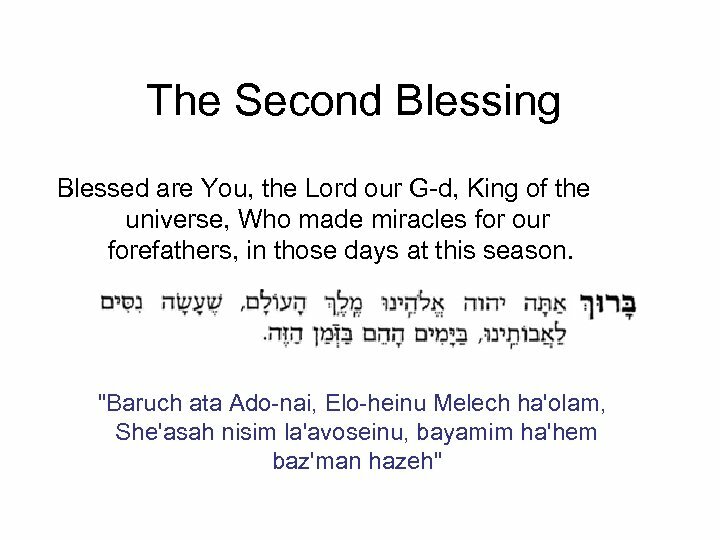 The Second Blessing Blessed are You, the Lord our G-d, King of the universe, Who made miracles for our forefathers, in those days at this season. 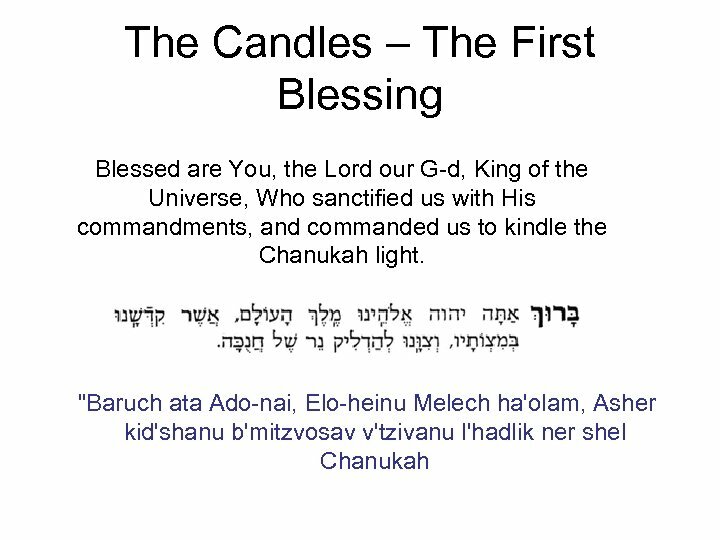 "Baruch ata Ado-nai, Elo-heinu Melech ha'olam, She'asah nisim la'avoseinu, bayamim ha'hem baz'man hazeh"
The Third Blessing This blessing is said on the first night only. Blessed are You, the Lord our G-d, King of the universe, Who has kept us alive, sustained us, and brought us to this season. "Baruch ata Ado-nai, Elo-heinu Melech ha'olam, She'hecheyanu, vekiyemanu vehigi'anu laz'man hazeh"
This paragraph is said each night, after the first light has been kindled: We kindle these lights For the miracles and the wonders For the redemption and the battles Which You performed for our forefathers In those days at this season Through Your holy priests. 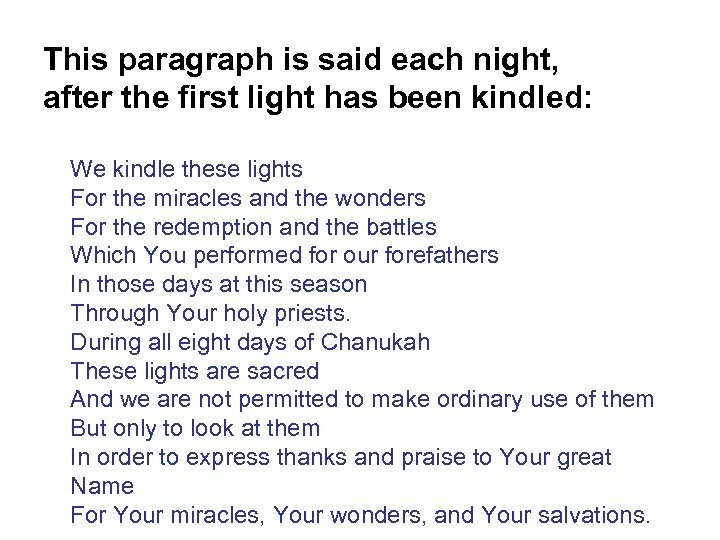 During all eight days of Chanukah These lights are sacred And we are not permitted to make ordinary use of them But only to look at them In order to express thanks and praise to Your great Name For Your miracles, Your wonders, and Your salvations. 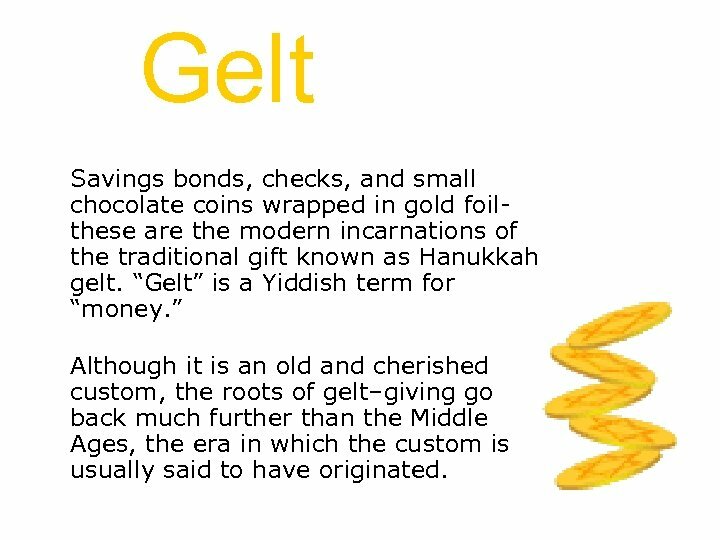 Gelt Savings bonds, checks, and small chocolate coins wrapped in gold foilthese are the modern incarnations of the traditional gift known as Hanukkah gelt. “Gelt” is a Yiddish term for “money. ” Although it is an old and cherished custom, the roots of gelt–giving go back much further than the Middle Ages, the era in which the custom is usually said to have originated. 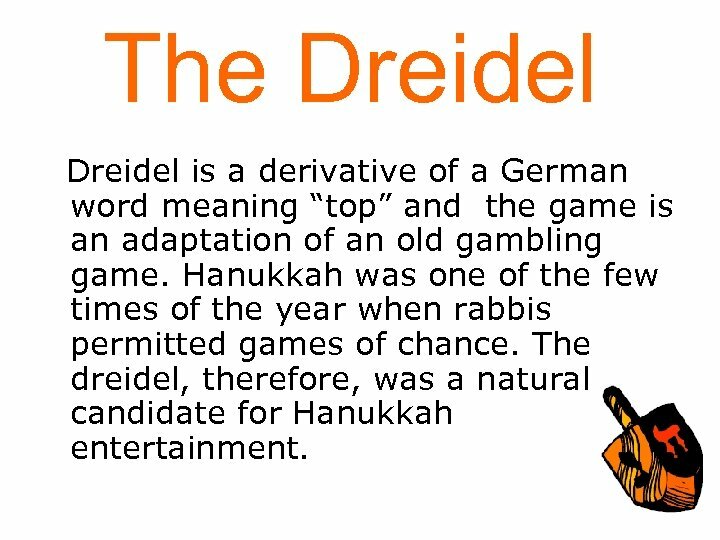 The Dreidel is a derivative of a German word meaning “top” and the game is an adaptation of an old gambling game. 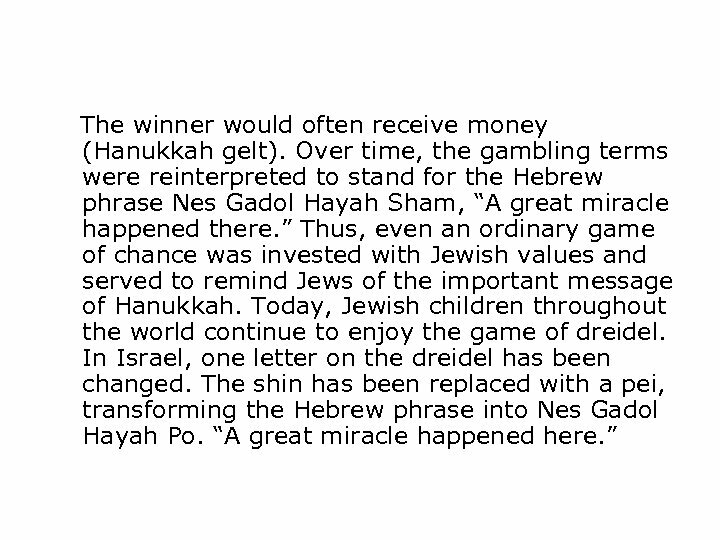 Hanukkah was one of the few times of the year when rabbis permitted games of chance. The dreidel, therefore, was a natural candidate for Hanukkah entertainment. The four sides of the top bear four Hebrew letters: nun, gimel, hei, and shin. Players would begin by “anteing” a certain number of coins, nuts, or other objects. 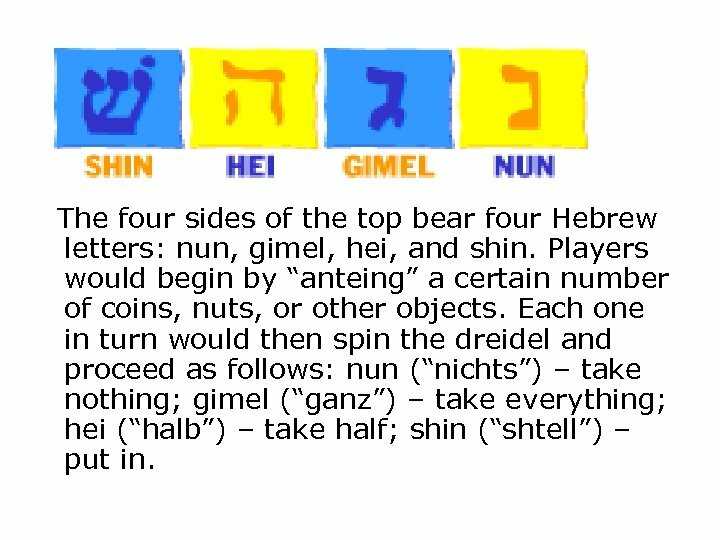 Each one in turn would then spin the dreidel and proceed as follows: nun (“nichts”) – take nothing; gimel (“ganz”) – take everything; hei (“halb”) – take half; shin (“shtell”) – put in. 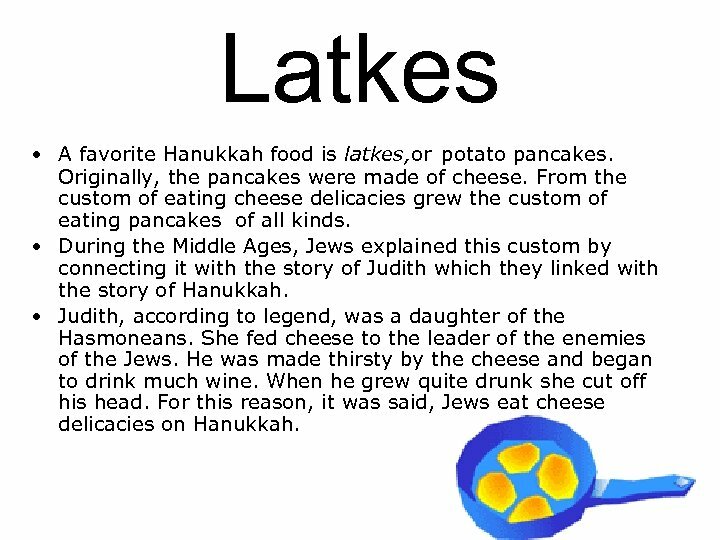 Latkes • A favorite Hanukkah food is latkes, or potato pancakes. Originally, the pancakes were made of cheese. From the custom of eating cheese delicacies grew the custom of eating pancakes of all kinds. 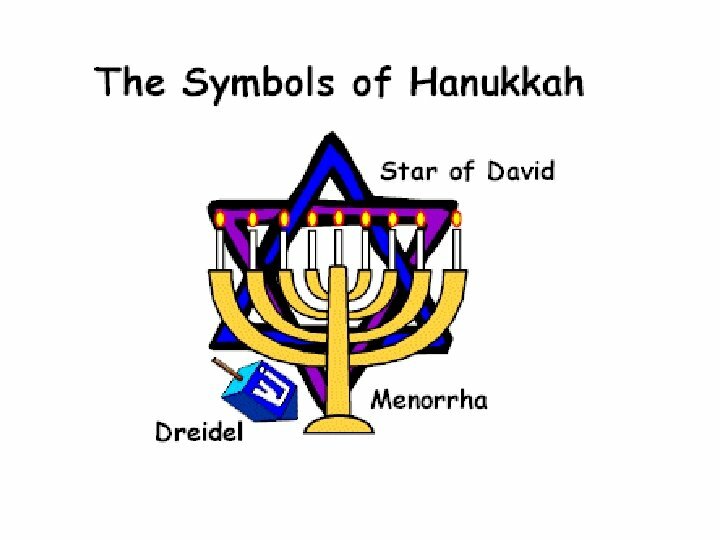 • During the Middle Ages, Jews explained this custom by connecting it with the story of Judith which they linked with the story of Hanukkah. • Judith, according to legend, was a daughter of the Hasmoneans. She fed cheese to the leader of the enemies of the Jews. He was made thirsty by the cheese and began to drink much wine. When he grew quite drunk she cut off his head. For this reason, it was said, Jews eat cheese delicacies on Hanukkah.